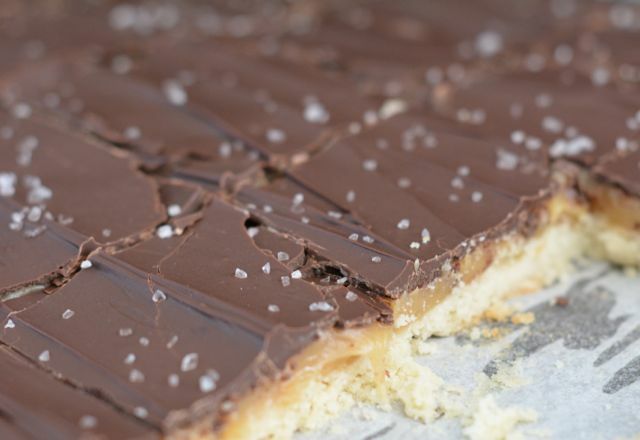 My mom used to tell me that millionaire shortbread will make you rich. Obviously she was joking, but I didn’t mind the idea. I loved the bars either way and was happy to eat them whether they brought me wealth or not. 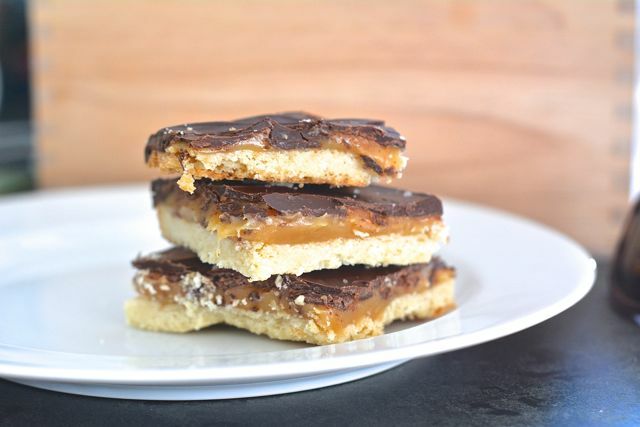 The premise of this is not difficult: shortbread, caramel, and chocolate are layered into an amazing dessert. I even dress mine up by using salted caramel and adding some extra flakes of sea salt on top. I first started doing this when the sea salt caramel trend began, and I am so glad I did. It is thoroughly amazing. These portable bars are perfect for spring picnics and are always a hit with kids. Cut them into squares and throw yourself a picnic! Keep reading for my millionaire shortbread recipe. The perfect, easy-to-transport dessert for your next block party. Step 1: Preheat the oven to 350ºF and generously coat a 15 × 10 jelly roll pan with cooking spray. Set aside. Step 2: In a large bowl mix 1 cup of the unsalted butter, the granulated sugar, and flour until well combined and a little crumbly. Press dough in an even thin layer onto jelly roll pan. Bake for 20–22 minutes, or until edges of shortbread are golden brown. Step 3: Meanwhile, in a large saucepan over medium heat, melt the remaining butter, condensed milk, corn syrup, and brown sugar. Stir mixture constantly with a wooden spoon until mixture has thickened and is a deep caramel brown. Stir in 1 teaspoon of the sea salt. Step 4: Pour caramel over freshly baked shortbread and spread it evenly in a thin layer with the back of a wooden spoon or a spatula. Place it in the fridge to set for 30 minutes. Step 5: After 30 minutes, remove the bars from the fridge. Melt the chocolate chips in a microwave proof bowl until they can be stirred smooth. Then spread the chocolate evenly over the caramel sauce. Sprinkle the remaining sea salt on top. Return the bars from the fridge to chill for an additional 30 minutes. Then, cut into squares or triangles and serve.